Giveaway free Genie TimeLine license key. Download and get 1-user lifetime serial key for Genie Timeline 10 home edition. The giveaway is short time giveaway in collaboration with WinX DVD. The home version is designed for home user only and without encryption features. 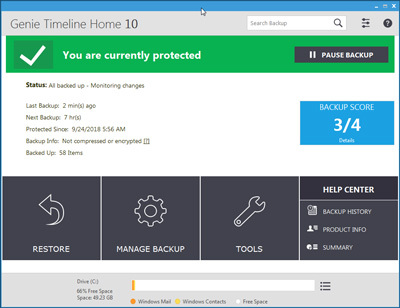 Genie Timeline Home is a backup and disaster recovery tools. By its vendor, the software also called time machine for Windows. Using this backup tool, you can create a backup data in three steps for ease. Unlike the pro edition, on the home edition there no encryption features. The software now absolutely free. Spend $0.00 to get serial code for the home edition. The new giveaway is active for a short time only. Get genie timeline Genie Timeline 10 license key through the following link. Open the giveaway page above. Complete the form. Requires name, valid email, and country. You’ll receive the license key via email. Download the installer and activate using the key you’ve received. To activate, go to the control panel then select enter serial number. Paste the code to activate. The giveaway open worldwide. Old giveaway Genie TimeLine 2016 is also still active. You can download old version Genie TimeLine 2016 with free license key through this giveaway link. If you nee better features, upgrade the version to professional edition. The professional edition now available with special discount. One of the extra features on professional edition is AES encryption. The info about new offer, read on the Genie Timeline Pro coupon page.